Although this disc was released in early May I found myself listening to this music at Petertide, that is the period or weekend around the feast of St. Peter on 28 June. The six voice Missa Surge Petre is a parody mass based on the six-part motet, which opens the disc. Although a new name to most of us, not least to me, Jacquet seems to have been incredibly prolific. There are twenty-four mass settings plus a hundred motets and psalms and more. Most of these pieces were composed for the Mantuan church with Jacquet’s principal patron Ercole Gonzago as its head. What a difference it might have made to Jacquet’s international reputation it Ercole had eventually been elected pope; one can only speculate. I have raved before about the Brabant Ensemble which consists of about fourteen singers. I have been much taken by three earlier discs: the Morales Lamentations (CDA67694), Jean Mouton (CDA67933) and Dominique Phinot (CDA67696). Their beauty of the sound and intonation, the women’s fresh and clear vocal quality, their ability to shape the lines with a unanimous expressive quality and their attention to balance make this ensemble stand apart from many other choirs. Their discography is now very extensive, with, one trusts, much more to come. I hope that they will continue to explore little known repertoire. Having said that I ‘m not sure if some of the pieces on this disc have really set them in the best light. Some of the music-making perhaps lacks the finesse and passion found on other recordings. I found myself often hazarding why this music is so unknown. An explanation is given in Stephen Rice’s, as usual, excellent accompanying notes. It’s the usual and not unreasonable problem of suitable and useable editions. It was something of a tragedy that George Nugent who was working methodically on editing Jacquet’s works died prematurely. Only is it proving possible for others to come to terms with the composer’s style. As regards the mass and motet Rice points the listener in the direction of some especially interesting aspects of the vocal scoring or the moments when the composer quotes from other works clearly still unknown to most of us. Fascinating it all is too. I found myself curiously uninvolved with the music. This may have been because the polyphony is so very dense. The composer does not even rest at the natural textual breaks: for example the ‘et incarnates est’ or the ‘crucifixus’. From that point of view I am reminded of Gombert who was also of a similarly nervous and unresting disposition. 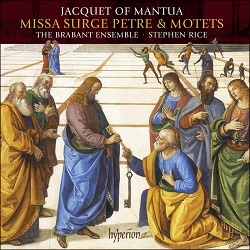 It's not surprising that there are works by Jacquet which have been credited to Gombert and vice versa. The jury is still out on some of these pieces as is the case with the wonderful five part In illo tempore … Non turbetur, which takes its text from St. John’s gospel and a conversation between Jesus and the disciples. Its melancholic atmosphere and its closely imitative texture are certainly ‘Gombertian’ with the master's Media Vita coming to mind. Then I came to the four part O Vos Omnes, a setting suitable for Holy Week, the elegantly beautiful and deft three-voiced Ave Maria and the setting of a sensuous text from ‘The Song of Songs’ O pulcherrima inter mulieres for three upper voices. Here I sensed a composer with something to say particularly in O Vos Omnes, which, like the motet Surge Petre is divided into two sections. The descending lines create dissolving and overlapping dissonances and are very special. These were part of several motets published in 1543 by Gardane where Jacquet takes pride of place over Willaert, Festa and Morales. The disc ends with Domine, non secundum, a large-scale six-voice setting published by Attaingnant in 1535 as was the motet Surge Petre both being early works. It is a setting of a prayer for Ash Wednesday. Stephen Rice discusses this work at some length. As at the wedding feast the Brabant Ensemble have left the best till last and the reason why Jacquet was so admired is revealed. From a textural point of view the composer’s originality shines through. It is in six parts but the variety in the vocal colouring I will leave for you to read in Rice’s clear notes. On top of that it is a very expressive motet that leaves you wanting to hear it again directly. I find myself again astonished that Summertown Parish Church can offer such a ‘silent’ venue. The acoustic is excellent and the choral sound hangs a little in the air after each phrase which is ideal. So not an entire thumbs-up for this disc but the music is fascinating in many ways and I shall return to it again and soon.